AN/SPS-48 Air Search Radar is a medium-range, three-dimensional (height, range, and bearing) air search radar whose primary function is to provide target position data to a weapon system and a ship command and control system. It provides for detection of targets as high as 100,000 feet and over a distance of 2 to 200 miles. By mid-2000 only the AN/SPS-48E version can be found in the fleet. Specifically, the 48E version is installed in the following ship classes: CV/CVN, LHA, and LHD. Also, the Navy plans to install the 48E version in the LPD-17 ship class. The AN/SPS-48 air search radar is a 3-D unit capable of providing range, bearing and altitude data on targets. The phased aray antenna was elecronically scanned vertically to provide altitude data, and the antenna rotated to provide bearing and range data. The radar was a critacal element in weapons control system, with search capabilities providing target data that was handed off to the AN/SPG-55 fire control radars. Closely integrated with the NTDS (Naval Tactical Data System), the radar was resistant to jamming, interference and weather effects. The Radar Set AN/SPS-48E is a long-range, three-dimensional, air-search radar system that provides contact range, bearing, and height information to be displayed on consoles/workstations. This is accomplished by using a frequency scanning antenna which emits a range of different frequencies in the E/F band (10cm). 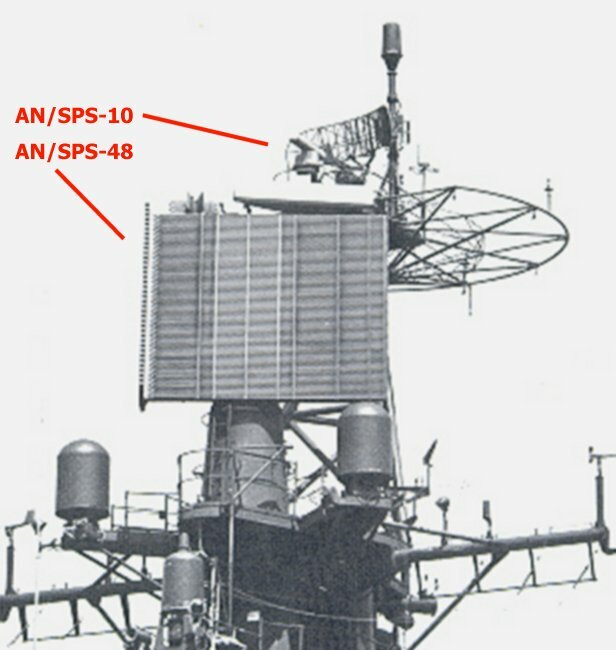 The AN/SPS-48C Radar system is a complete system including all component elements - Transmitter, Receiver, Computer (Radar and Automatic Detection and Tracking), Frequency Synthesizer and Height Display Indicator. The AN/SPS-48E uses a combination of mechanical scanning in azimuth and electronic beam-steering in elevation to provide plan position and height information on targets. Radar videos, converted to digital format, are displayed on consoles/workstations to provide a means for the operators to perform manual radar search, detection and tracking functions. Radar triggers and antenna bearings are used to properly display radar video data on the consoles/workstations. True bearing indications are displayed on the consoles/workstations to indicate whether the track position is displayed in relationship to ownship or true north. Elevation scanning is accomplished, under computer control, by changing the frequency of the transmitted RF energy that goes to the radar antenna, thereby radiating a series of pencil beams. Height information is generated using the following philosophy. If the transmitted frequency rises then the beam travels down the face of the antenna; If the transmitted frequency falls then the beam travels up the face of the antenna. As frequency is varied, the beam axis will change, and scanning can be accomplished in one axis (either elevation or azimuth). The radar set is designed so that it keeps track of the frequencies as they are transmitted and then detects and converts the returned frequencies into 3D display data. Variation in frequency tends to make this radar more resistant to jamming than if operated at a fixed frequency, and it also provides a solution to the blind speed problem in MTI systems. Frequency scanning does impose some limitations in that a large portion of the available frequency band is used for scanning rather than to optimize resolution of targets. Additionally, this imposes the requirement that the receiver bandwidth be extremely wide or that the receiver be capable of shifting the center of a narrower bandwidth with the transmitted frequency. The radar also provides accurate height data despite the fact that the antenna does not have mechanical vertical position elements. This is accomplished by factoring in the effects of pitch and roll of the ship which changes the transmitted frequency accordingly. The ship's gyro system provides the radar set with this pitch and roll data. The AN/SPS-48E has several operational features to allow optimum radar performance: an automatic detection and tracking capability to detect and track multiple air targets automatically; a moving target indicator capability to distinguish moving targets from stationary targets and to improve target detection during the presence of clutter and chaff; and an anti-ship missile detection capability to provide for the early detection of anti-ship missiles launched from aircraft in heavy electronic countermeasures conditions. The AN/SPS-48E is optimized to provide sophisticated and reliable tracking performance in an intense ECM environment. The performance and capabilities of the AN/SPS-48E are greatly enhanced by the addition of the Auxiliary Detection Processor (ADP) unit. These enhancements include: target detection capability near/over land; low flyer, slow flyer and low radar cross section target detection; greater target tracking capacity; an improved threat reaction time; and target detection that is improved by direct correlation with the Cooperative Engagement Transmission Processing Set (CETPS) AN/USG-2(V) system.